Stock # PJN503557, Regular Unleaded V-8 5.6 L/339, Automatic, 9068 mi. This Nissan Titan XD has a powerful Regular Unleaded V-8 5.6 L/339 engine powering this Automatic transmission. Only 9,068 Miles! Carfax One-Owner Vehicle. Dealer Certified Pre-Owned. Part-Time Four-Wheel Drive, GUN METALLIC, BLACK, LEATHER SEAT TRIM. 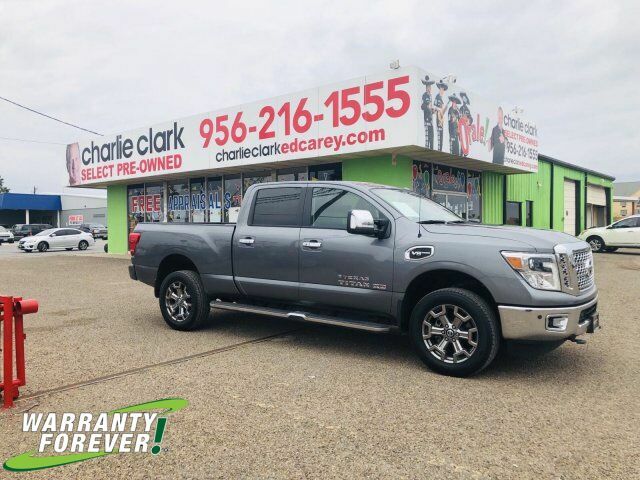 [Z66] ACTIVATION DISCLAIMER, [M11] REAR SEAT STORAGE COMPARTMENT W/LUGGAGE FLOOR, [B93] SPLASH GUARDS (B93), [B12] RUNNING BOARDS, [B09] TEXAS TITAN EDITION -inc: Texas TITAN badging, Metallic Kick Plates, Chrome Grille Inner and outer, Texas TITAN Floor Mats (B09), Wheels: 20" x 7.5" Chrome, Chrome Exhaust Finisher, Valet Function, Urethane Gear Shift Knob, Transmission: 7-Speed Automatic, Transmission w/Driver Selectable Mode, Sequential Shift Control and Oil Cooler, Tracker System.